A ‘Gingivectomy’ becomes necessary when the gums have pulled away from the teeth which creates deep pockets that become susceptible to periodontal disease. These deep pockets make it hard to clean away plaque and tartar. A Gingivectomy is the surgical removal of the gum tissue and is usually done before the gum disease has damaged the bone and supporting teeth. Your South Calgary Periodontist does this by removing and reshaping any loose, damaged or diseased gum tissue. We perform this procedure in order to get rid of the pockets between the teeth and the gums. By removing the pocket walls, a Gingivectomy allows your periodontist to remove the calculus and perform Scaling and Root Planing on the tooth roots. This creates a favorable environment for healing in the gingiva to occur as well as enabling the restoration of the gingival contour. The Gingivectomy procedure was originally developed in order to treat periodontal disease but it has now become common practice in Periodontal Cosmetic Surgery. A Gingivectomy is used to remove overgrown gum tissue and to improve the appearance of the gums. 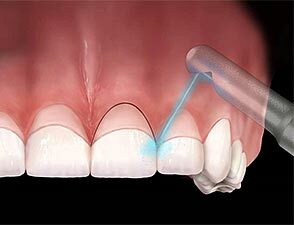 Gingivectomy is the most common procedure performed using dental lasers. Lasers can be used to precisely ‘incise’ (shape) the gingiva for restorative, cosmetic and periodontal procedures. Lasers have the additional benefit of offering rapid healing time and reduced pain. How do you prepare for a Gingivectomy ? Before either of these procedures, your South Calgary Periodontist will have a discussion with you regarding your oral hygiene habits. Your periodontist will also give you further instructions for preparing properly for the surgery. It is important that before a Gingivectomy you get a thorough cleaning. You may have to go through root planing in order to remove the tartar or calculus from the existing pockets. A periodontal dressing will be placed on your gums after your Gingivectomy. This periodontal dressing is a type of bandage that remains in the treated area for approximately one to two weeks. You may have to follow a soft diet, avoid spicy foods and refrain from eating crunchy foods during this healing period. Your periodontist may also prescribe some pain medications and a medicated mouth rinse. You must make it a priority to keep your mouth clean during this healing period. Your periodontist will advise you not to brush the teeth in the surgical area while the periodontal dressing is still there. For the rest of your mouth, you can brush and floss normally, just as you would before your procedure, although you may have to be a little more careful with a periodontal dressing nearby. When this periodontal dressing is removed, you will be able to brush and floss your teeth normally once again. You should not be worried if the healing tissues bleed slightly after the dressing has been removed and you resume your brushing or flossing for the first time. Any slight bleeding after the dressing has been removed is perfectly normal. When you have your periodontal dressing removed after a week or two, your gums will start looking natural again in about one month. It may take about three months for your tissues to heal completely. Call us at (403) 278-5446 to book your Gingivectomy consultation appointment today!